Miss Berry writes to Mrs. Campbell to say that it was good to see her and that Charlie is on a trip to Atlanta to pick up some furniture. She also asks when she can send Charlie to get the red azeleas and drop off some furniture in Atlanta to be recovered. She asks about the sofa pillow and lamp and says talks about the visitors The Berry Schools have. 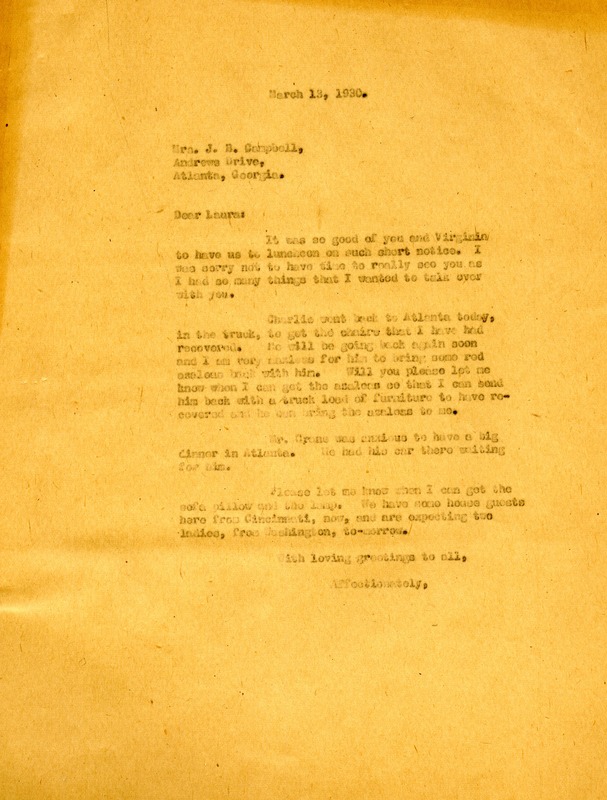 Martha Berry, “Letter to Laura Campbell from Martha Berry.” Martha Berry Digital Archive. Eds. Schlitz, Stephanie A., Chelsea Risley, et al. Mount Berry: Berry College, 2013. accessed April 20, 2019, https://mbda.berry.edu/items/show/11966.